In a country like India where government doesn’t offer much benefits to its citizens after their retirement in their time of need, savings done by them during their earning time is the only hope to live respectful remaining life. otherwise also all our needs and goals depends on how much we have saved and what return you have received on your saving. Here we are discussion about the SIP – Systematic investment plan which can be termed as the best possible way of investing money to get best possible return from different investment options. SIP stands for the “systematic Investment Plan”. The name itself says the meaning and intent of the term “SIP” . SIPs is way to invest in any particular area in weekly, monthly, quarterly, Annually or in in any other fixed time frame as the investor may choose as per his convenience. Systematic investment leads to the discipline in your investment habit and make it as part of your daily/monthly budget. Discipline is the only thing you need for achieving most of your goals in life, it is the way to achieve best out of your efforts for fulfil your dreams and lend on your target in a planned manner. SIP in Investment is the trend of these days as it turns your small but regular investments into a corpus which you think should be good enough for achieving any important goals or meat out any future expense. The First thing about SIPs is that you don’t need to worry much while investing as you are investing a fixed amount of money at different intervals of time at different stages of market indices which averages your entry cost so you will not think about that the investment which you have made was done at higher levels. Why we do SIP ? This is human nature that when the market is high Investors tries tip fishing and loose their money as zig zag movement is the common market behaviour whereas when then market is low we refrain investing in market thinking about the more bottom side due to overall negative market trend and adverse market situation. SIP ends this kind of problem for the investors as Investors are investing at every stage without thinking about the market mood or its position. One of features of SIP is that it doesn’t demand huge one-time investments, rather a little every month is more than enough. You even get flexibility. You can stop investing whenever you want or increase or decrease the investment amount as per your will. Since the trend of the market is northward only for past many years and if your entry cost is average of high and low of the market that means you will be surely benefitted in the long run. The most common way of investing in stock market is mutual fund as they have better visibility of stocks and qualified financial analysts and fund managers to take right step at right time. But mutual fund are also subject to the performance of the stock market if they linked to equity and again the question of entry level and exit level comes in for the investors but you go through the SIP route, you can find the solution of this problem as well. Many mutual funds gives options to investors to invest weekly, fortnightly, monthly or quarterly and it depends on the investors what they choose as per their convenience but while clubbing these two investment instruments i.e. Mutual fund + SIPs , investors can rest assured that they have done justice to their investment and can expect a sense of security plus good return from the market. Though security is not a right word for any investment in stock market but still investor will do his best to secure his money to the best possible extent. When to start SIP ? It is always better to start investing in SIP at the earliest for better potential growth. The power of compounding works here as well, the sooner you will invest bigger your corpus will be. Through SIP, when you invest the same amount in a fund at regular intervals over time, you buy more units when the price is lower and fewer units when the prices are higher. So, your average cost per share (or per unit) is reduced over time. Thus, SIP seeks to provide reasonable returns over a period of time. As we are talking about the SIPs here but we are not at all ignoring the power of lump sum investment as its coupled with the power of compounding. If you are investing at good level, means lower level, which generally all investor misses, the lump sum investment become much more powerful than the SIPs but it happens in hardly 5% cases. The retail investors who try to do bottom fishing in the market, they ends up loosing money as no indicator can predict the market accurately. Its more of the luck which gets them entry in the market at good levels. No doubt if the risk is more the return will also be more in lump sum investment but considering the higher percentage of risk involved it is always advisable to invest in systematic manner and if you feel that the market is down and right levels arises you could also increase the quantum for a while and when then market is at all time high and looks vulnerable in valuation terms you may opt decrease the quantum of investment in the SIPs. This will get you the benefits of lump sum investment as well as systematic investment. It depends on the fund manager and his approach of investment and moreover the risk appetite of the investors . 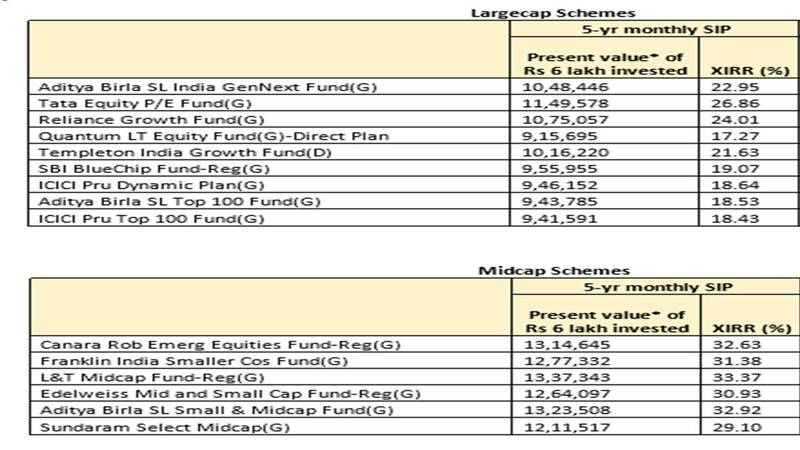 Small and mid cap funds tends to give more return than the large cap funds but carrying higher risk than the large cap funds. Large cap companies are general well stablished in the market and already performing better then the small or medium cap companies therefore carrying less risk in comparison to small and medium cap companies. For example, If would have invested Rs. 6 lac during the past 5 years through SIPs your money would grown nearly to Rs. 13 lac by now. Though it is important to note here that the past performance does guarantees about the future return also but it gives you an idea that what can be expected from this kind of Investment. Nowadays you have an option to go for the stock specific SIPs also and the same can be done directly from your de-mat account. If any investor is strongly bullish on any particular stock he may opt to accumulate the stock through SIP mode which gives him a benefit to invest at different levels and averages his price.